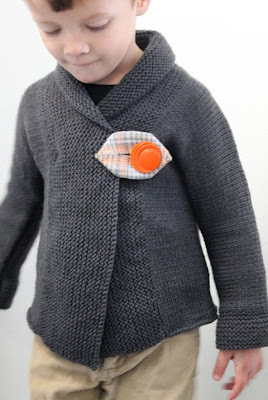 SHAWL COLLAR BABY COAT PATTERN NOW AVAILABLE IN THE SHOP! I am totally distracted by nice weather and have neglected my repeated promises to finish the pattern for the Shawl Collar Baby Coat. A few hours of chilly temperatures was all it took to put the final touches on this little project. I'm tempted to hoard this gem of a sweater all to myself, but I can not possibly make it enough for it to reach its full potential. I have more fabric scrap and vintage button combinations than I could use in a year of nap times, so (deep breath) I am sharing it with you. Take good care of it, and only knit this sweater for the sweetest little children, with the happiest thoughts in mind. After a final proof read, the pattern will be in the shop tomorrow. so exciting! Oh how I wish I could knit one for my little man. I may have to start watching some knitting youtube videos since I have lots of needles and yarn around here from my thrift stores! Good luck with the pattern sales!